As I have discussed before in my interoperability series, federated viewers are remarkably effective within regional contexts, beyond which scaling of the model becomes impractical. I have also discussed the need and ways of building intelligence into a federated framework. Here I am going to expand further on my previous ideas. Users perceived the mobile interface of ClinicalConnect as useful but were neutral about the ease of use. It is important for health information systems to talk to each other. Unfortunately they speak different languages. 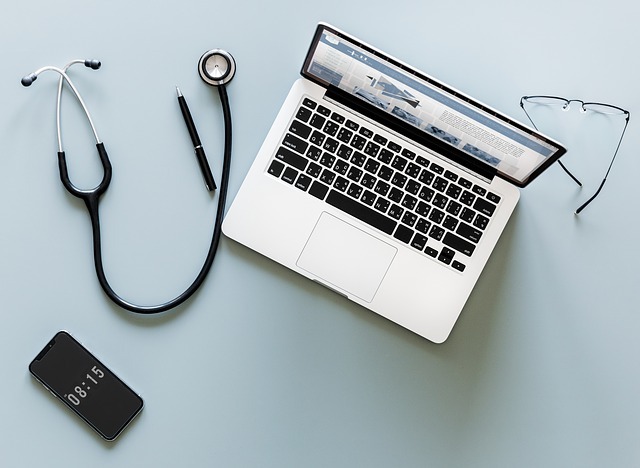 This article is not for eHealth experts to understand the nuances of interoperability (HIE), but for health care professionals to have an idea about what is out there and what can be expected in the future. When we consider HIE we have to think about what is being exchanged (package), how the information is organized (format) and how it is being transported (protocol). Though it is not essential to know, few terms that you might recognize are: HL7, XML for format and HTTP, TCP/IP for protocol. (Have you heard of MLLP? Google it!) The donor has the information in a certain format and protocol while the recipient expects it in a particular format and protocol. At the core of all HIE platforms such as MirthConnect or OrionHealth’s Rhapsody, is an engine that does this conversion. Format and protocol of donor to format and protocol of recipient. Simple eh? Now most of these platforms have a user interface or IDE for making this connection. You can also introduce certain filters at this stage. Enterprise systems like Rhapsody presents an attractive visual interface, whereas open source solutions may not be very user friendly. What else can the engine do? It usually keeps a log of all package deliveries and whether the delivery was successful. If the delivery failed, it can attempt again and alert the maintenance team through a console. The console can even be mobile as in rhapsody. Though the engine can store the package itself for a limited time, storing the package is not really its job. A single department in a hospital sending lab reports. All departments in a hospital sending all sorts of information. Several hospitals in a region. Another department in the same hospital expecting a lab test report. A family physician who wants real time access to the lab reports for his patients admitted in the hospital. We need a separate layer between the engine and the recipient to support all these use cases. Let us call this layer mediator. The mediator can pull data in real time from donors or store it in a local database. The first one is the federated model while the other one is the centralized model. Federated is slow but up-to-date while centralized is fast but not concurrent. Mixed model has both and is preferred. 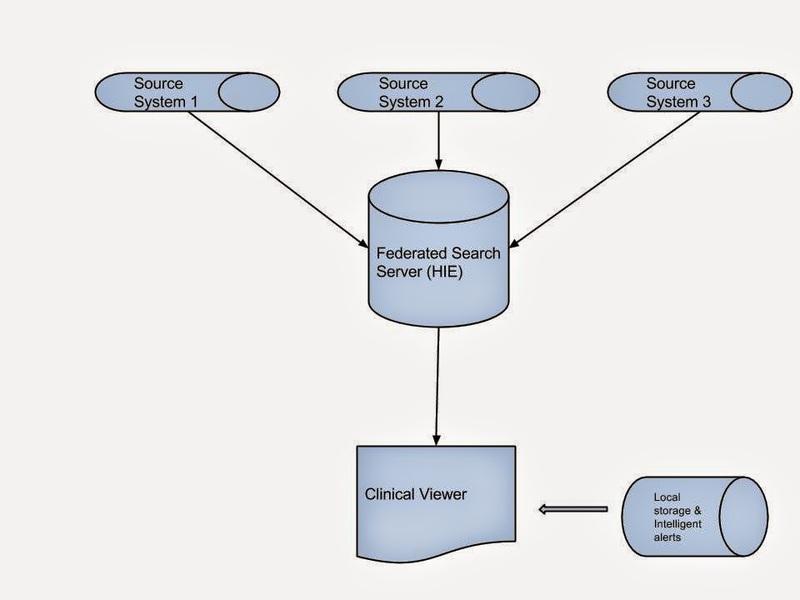 The so called clinical viewers are federated mediators with a web interface. 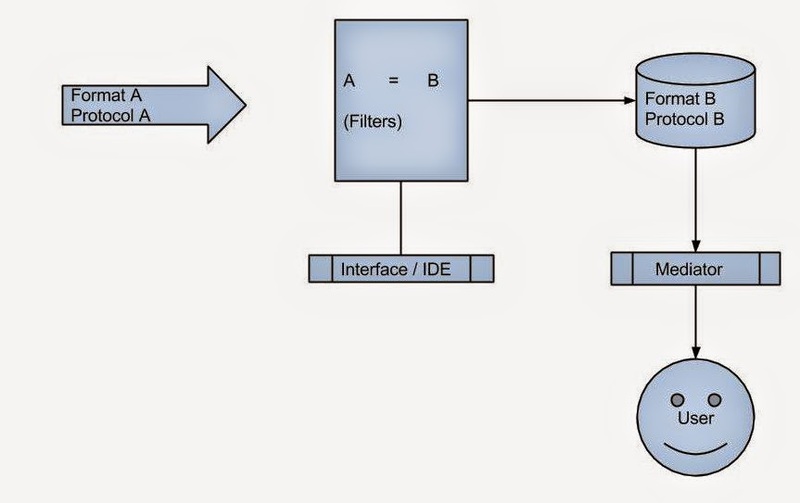 Emerging paradigms like NoSQL and RDF may be ideal for data representation in mixed model. I have discussed RDF before. Will discuss NoSQL soon! One of the most promising trends in Health Information Technology (HIT) is Health Information Exchange (HIE). Several HIE initiatives are jostling for space in the HIT arena in many areas. Like most other public HIT projects, funding depends on benefits evaluation. Benefits evaluation could be a difficult undertaking requiring careful planning even for an Electronic Health Records system. The goal of HIE is to facilitate access to and retrieval of clinical data to provide safer, timely, efficient, effective, and equitable patient-centered care. All the goals are subjective open to varied interpretations, making benefits evaluation in HIE, a nightmare. Canada Health Infoway (CHI) published a benefits evaluation indicator technical report in 2006, that was upgraded to a new version in 2012. After comprehensive search and literature evaluation CHI has proposed the various parameters that are important under various scenarios with a broad focus. HIEBR is an attempt at creating a simple tool based on the CHI report for evaluating HIE benefits from a user perspective. The focus is on simplicity and HIEBR is not claimed to be a comprehensive HIE benefits evaluation tool. The questionnaire has 10 Likert scale questions that have to be scored from 0-4 giving you a score ranging from 0-40. This is multiplied by 2.5 to represent this on a more user-friendly scale of 100. However, it should be noted that HIEBR score does not represent a percentage. The main purpose of HIEBR is to assess the impact of an HIE initiative. So it is designed to be administered pre and post HIE implementation and compared using non-parametric statistical tools. SUSie is another tool that combines System Usability Scale with basic benefits realization questions incorporated, retaining the SUS style. Please cite this page as below, add your study reference in our wiki page, and share this page if you use this tool. Cite this article as: Eapen BR. (November 1, 2014). 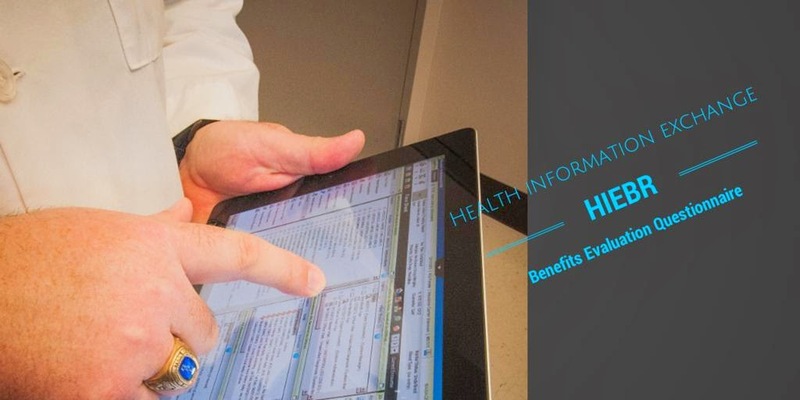 Bell Eapen - Health Information Exchange Benefits Realization Tool HIEBR. Retrieved April 18, 2019, from https://nuchange.ca/2014/11/health-information-exchange-benefits-realization-tool-hiebr.html. Last year, one of my colleagues proposed an add-on for a popular fitness app as a course project. There has been a whopping increase in the number of health and fitness apps, monitoring a variety of parameters from blood sugar to the number of strides you take. As my colleague pointed out, all the necessary features are never there in any single application. How do you write an add-on for an existing app? Apps do not talk to each other much like their big brothers: health information systems. Apple is trying to solve just that, with its new HealthKit framework. HealthKit allows apps that provide health and fitness services to share their data with the new Health app in the cloud and with each other. A user’s health information is stored in a centralized and secure location and the user decides which data should be shared with your app. I have a couple of friends currently working on population pharmacokinetics. HealthKit may be an ideal framework for sharing pharmacokinetic data too. Though HealthKit is lingering over a last minute bug that slows down apps that use this framework, it may be a novel and effective tool for app designers. However whether the technology will bring the prophesied ‘Healthcare revolution’ remains to be seen. 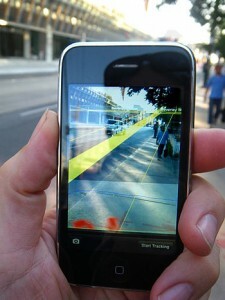 The new generation apps are going to make life difficult for physicians, already inundated with lots of data. Hope the proverbial ‘Apple a day’ does not happen! Be on the watch out for the Apple watch as well. I feel Apple watch is more likely to be a disruptive innovation than HealthKit itself. Watch is always more intimate and ubiquitous than any other wearable device. The built-in accelerometer, heart-rate sensor and GPS along with Apple’s ingenuity provides enough reason to expect amazing functionality. More data is probably as dangerous as the lack of it! Health information exchange (HIE) allows healthcare providers and patients to access and securely share medical information electronically. Several organizations are now emerging to provide both form and function for HIE efforts, both on independent and governmental/regional levels. However the biggest challenge is Change Management, as healthcare providers are exposed to one more ICT tool that they need to master for providing quality care. There are no formal tools to study individual and organizational attitude towards HIE or to measure their usability. Physician attitude towards the impact of HIE on reducing healthcare costs, improving quality of patient care, saving time and their concern about data privacy and security are important in HIE adoption. Usability is also of vital importance in the meaningful use of HIE tools. SUSie (SUS for HIE) is an attempt at creating a useful tool for measuring the above factors. It is modelled based on System Usability Scale (SUS), one of the most used questionnaire for measuring perceptions of usability. Five additional questions were added to assess factors that are specific for HIE. The scoring is based on a scale of 5 ranging from Strongly disagree(1) to Strongly agree (5). The ratio of positively and negatively worded questions are maintained and the final multiplication factor was changed to 1.67 to represent the final score on a scale of 100. I hope that this would make the interpretation similar to SUS and benefit from the prior experience available for SUS. The questions and details of scoring are explained below. Brooke, J. (1996). “SUS: a “quick and dirty” usability scale”. In P. W. Jordan, B. Thomas, B. A. Weerdmeester, & A. L. McClelland. Usability Evaluation in Industry. London: Taylor and Francis. Wright, Adam et al. “Physician attitudes toward health information exchange: results of a statewide survey.” Journal of the American Medical Informatics Association 17.1 (2010): 66-70. I think that I would like to use this Health Information Exchange System frequently. I found this Health Information Exchange System unnecessarily complex. I think this Health Information Exchange System will reduce healthcare costs. I think that I would need the support of a technical person to be able to use this Health Information Exchange System. I thought this Health Information Exchange System was easy to use. I thought there was too much inconsistency in this Health Information Exchange System. I think this Health Information Exchange System will improve Quality of Patient Care. I found this Health Information Exchange System very cumbersome to use. I found the various functions in this Health Information Exchange System were well integrated. I am concerned about the privacy and security of healthcare information on this Health Information Exchange System. I found this Health Information Exchange System can save me time. I needed to learn a lot of things before I could get going with this Health Information Exchange System. I would imagine that most people would learn to use this Health Information Exchange System very quickly. I found that I had to significantly change my workflow to use this Health Information Exchange System. I felt very confident using this Health Information Exchange System. Add up the converted responses for each user and multiply that total by 1.67. This converts the range of possible values from 0 to 100 instead of from 0 to 60. The value is not a percentage. Average value is approximately 68. This is not a validated questionnaire. SUSie may be used to compare groups or for comparing pre and post intervention. I have created a wiki page for updates. Please add any use-cases you can think of to the Wiki page.